On April 4th this year I appeared at Swansea Crown Court again without representation (accompanied by my Mackenzie friend). This time I was questioned more fairly and was able to show the judge the photographs that I had received. After approximately 20 minutes of being inside that courtroom the judge upheld my appeal stating that the photograph that I had been sent was "appalling". Hence my £150 fine and three penalty points have now been cancelled. It was an extremely nerve wracking but worthwhile experience! 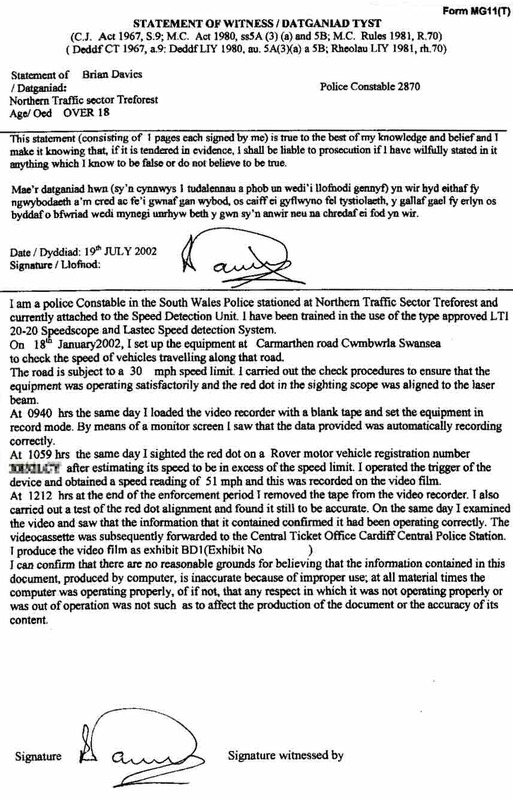 In April 2002 I received a letter from the safety camera unit stating that I had recently been sent an NIP blah blah blah and that I had to contact them otherwise I might face prosecution. I thought that it was an April Fool prank as I received it around this time and had not received an NIP. Wrote back to ask whether this was indeed a hoax. Received a reply stating that it was not a hoax and if I did not provide details of who was driving that day, etc that I faced possible prosecution. Replied to state that as it was five months hence (it was now May), that I could not remember who was driving that day (January 19th 2002), and I had questioned all those who may have had access to my car keys and no-one could remember. I requested photographic evidence, which frankly was appalling and yielded no further clues to the identity of the driver (although I have to add that I am the main driver). I was them summonsed to appear before magistrates on August 20th 2002. This hearing was adjourned to October 21st 2002 in order for a witness to be called (don't think they anticipated a not guilty plea!). When I arrived at the court with my father, who was acting as my Mackenzie friend, we were told that the case would have to be rescheduled, as there had been an overrun of a case from that morning. We had a very strong hunch that this was not exactly the truth as there was absolutely no sign of any police officers and we were expecting the only witness (the police officer who operated the camera on the day in question) to attend. We had to go into the court to fix a new date, during which time I was asked by the clerk of the court whether I could identify the driver from the photograph. When I said that I could not, his reply was "well it looks clear enough to me". I then wrote a formal letter of complaint to the court the following day requesting that I stand before a different clerk and panel of magistrates the next time as I felt prejudiced by his comments. This was granted. 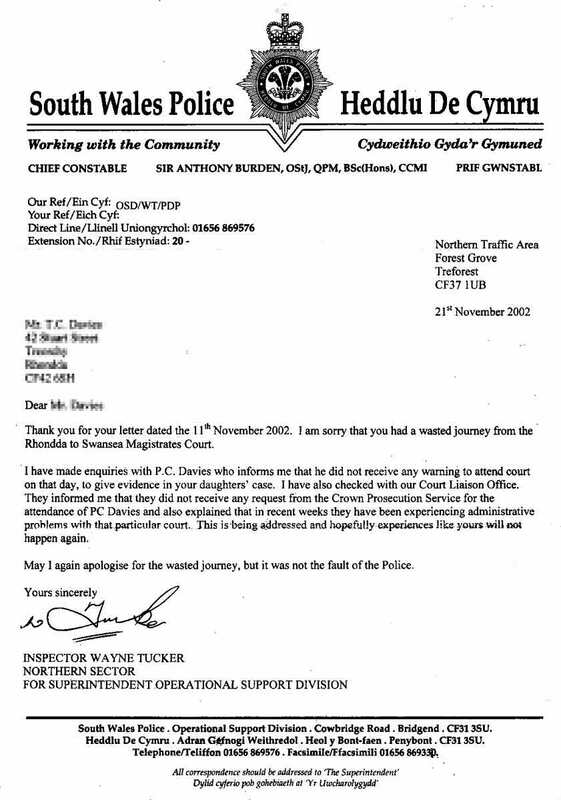 The next day I wrote to the traffic police in Pontypridd, calling their bluff, to ask why PC Davies had not attended court, saying that it had caused us great inconvenience, etc. RESULT! By return of post I received a very nice letter from them, full of apology, informing me that the CPS had FAILED to call PC Davies! In the meantime I received a copy of the police officer's statement which contained a different date and a different location to those given in the NIP (there are two Carmarthen Roads in Swansea). Which date and location was I to work on? My defence was that I had not received the NIP within 14 days (S1 RTA 1988) and on the second charge that I had acted with due diligence to try to ascertain who had been driving the car that day and also that I wasn't sure of exactly which date we were talking about! (although the NIP did correlate with the video evidence - which incidentally was "inconclusive" in the words of the magistrates). On December 2nd 2002 I pleaded not guilty to speeding and not guilty of failing to identify the driver. The reason that I had not received the NIP was probably the fact that I lived on a new housing estate with plot numbers and house numbers and that there had been many instances of people's mail going astray. I was questioned a lot about this but not at all about what steps I had taken to identify the driver. When it was my turn to question the police officer I drew his attention to the fact that his evidence contradicted the NIP to which he replied that it must have been a typographical error. I had expected at this point that the case would then be dropped due to lack of evidence but astoundingly the Magistrates did not seem to bat an eyelid at this! After an hour's deliberation I was found not guilty of speeding (14 day rule) but guilty of the S172 charge. I immediately appealed in writing to state that I was appealing on the grounds that I had not even been questioned in relation to the second offence. These Case Files are summaries of descriptions sent to us by individuals who are entirely independent of PePiPoo. We have no independent means of verifying that they are accurate and we can therefore take no responsibility for their content. Copyright © 2001-2012 PePiTec Ltd. Please click the button to accept our cookies. We’ll also assume that you’re happy to accept them if you continue to use the site.